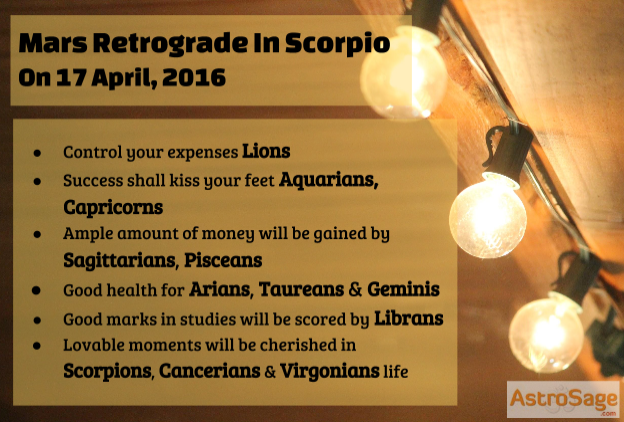 On 17 April, 2016 Mars retrograde in Scorpio will going to happen and it will turn direct on 30 June, 2016. Now, know whether due to Mars retrograde an emotion of aggression or passion will be developed. Get ready to discover the dynamics and issues related to it. The following predictions has done by our expert astrologer that will help you to get prepare. Arians, love yourself enough to live a healthy lifestyle. During Mars retrograde in Scorpio, there are chances that you might fall ill. Some unfavorable changes might be seen, therefore, the key message for you is to drive safe. Neighbours are priceless treasure, maintain good relations with them. Throughout, this period it is advised not to make any decisions hurriedly in love instead celebrate love, pen down your feelings and express your love. Do not let misunderstandings and suspicious relatives become a barrier in your love life. Students will have to work hard to fetch good results. Moreover, prevent yourself from investing in share market. The time will prove to be prestigious, if you stay away from disputes. Taureans, during Mars retrograde in Scorpio, some of your decisions might result in unfavorable situations. So, be careful. You are required to be in a positive aura with good people. Thus, to enjoy an auspicious time, you are suggested to maintain a distance from cruel people and from risky places. Make your health a top priority than any other work. In starting days, time is not very pleasing for love relations although, you may get ready to take their relationship onto a next level. As well as your soulmate’s attractions will going to improve with a supportive nature. This time span will be okay for work & for monetary matter. Lastly, a victory is assured in every task. Geminis, good outcomes will be received by you during this Mars retrograde in Scorpio. The value of money, fame and power will going to increase now. Money from unhoped places will enter your life. But, avoid spending in uncontrollable manner, otherwise bad consequences can be seen in future. Support from seniors at workplace will help you to achieve rewards and success. Also, students will enjoy good scores. Time is very auspicious to confess your love. Chances to roam or to go on a date are very high. Do not let any carelessness affect your health. You might suffer from Issues related to stomach might be a troublesome. Cancerians will get mixed outcomes due to Mars Retrograde In Scorpio. During this time, your power and efforts will go through a test. Along with this, at workplace, lady luck will going make your fortune shine. A gratifying time will be seen by you, you might plan new strategies related business in foreign country. With less time also you will be able to create a passionate love with partner, moreover your expectations from partner will increase. There are likely chances that your children might prove to be a troublesome. Therefore, control and watch their expenses. Health will be general. Lastly, be careful, you might hurt someone’s emotion unknowingly. Lions, your starting days might be spent in preposterous expenses. Hardwork pays off, thus believe in true devotion and keep giving your best. Your financial life will be better, if you have control on your expenses. “Family is like a tree with many branches, which may grow in different directions but roots always remain same”. Therefore, maintain the bond. You might observe tensions occurring between you and your spouse. Moreover, lady’s health in a house might put you in tension. Folks, working well in an organisation, life will be much better for you during Retrograde Mars in Scorpio 2016. Lastly, love life will be much better. In the period of Mars retrograde in Scorpio, you have to make lots of efforts in maintaining your budget. Possibilities of investing in a share market are there. Decisions determine destiny, hence have patience and invest wisely. Office Goers will enjoy the good time, appreciation from seniors will be received. Familial life will be good, whereas good terms with partner might lead you in nail-biting. Lovers, this time is very auspicious to confess your love. So go for it. Your children will become the reason behind your happiness. However, seasonal health problems might bother you. This Mars retrograde in Scorpio will bring you the favorable results in economical life. But, giving you clear indications of staying away from controversies. Since, the time is not pretty much in your favor, delay your traveling plans. Your expenses will be raised, so have a proper budget plan. Otherwise, not to worry, the lended money will be received now. Your love life might be less favorable as some issues might get created whereas students will relish good results. Office goers, many new chances will be received. Lastly, those who have been going through illness, since long time, health will remain good. The most prominent sign as Mars retrograde will going to happen in Scorpio only. So Scorpions, you will going to enjoy many lovable moments with partner like going for a movie or on a dinner. The relationship will become so strong that it may turn into a marriage. Further, focus on your health and maintain a healthy diet. A little emotional strain might be caused due to the children in home. So, make love your weapon and explain them; what is right or wrong?. “A Budget tells your money, where to go? Instead of wondering where it went. Thereby, have a proper budget plan ready. Moreover, students are required to pay more attention. You will be granted with mental peace while trips are on the card. Sagittarians, your monetary side will become more powerful due to retrograde Mars in Scorpio 2016. But, avoid investing in new venture. However, success is assured in miscellaneous activities. You may get a chance to move abroad for a new job. Furthermore, financial life will be flourished. Students who are planning to go for higher studies, bright opportunities are waiting. While love life will be beautiful especially for those who are in love with a colleague. Health problems related to eyesight might faced. Therefore, consult a doctor on time. Lastly, do not let your anger overpower you. Capricorns, arrival of new opportunities will be granted during retrograde Mars in Scorpio. A new confidence level and energy will be seen in you that will lead you to success. Your intelligence will cross all the limits. Chances of getting rewards points in real estate are there. Students are required to learn that good score are perfection, persistence and hard work. Furthermore, your love life will be passionate in true terms. Especially, if your love belongs to the same working place as of yours. Healthwise, you will remain fit and strong. However, health issue of some relative might be bothered. Aquarius During the time period of Mars retrograde in scorpio, Aquarians may go on work related foreign trips. Best friends make the good times better, thus your tough time will be passed easily. Whereas, while not adding much success at work & business will provide fruitful outcomes. At workplace, you will get full support from seniors and colleagues. Moreover, you might go for secret relationship with partner. There is a chance, you might get attracted towards more than one person. However, being careful will help you to stay away from defamation. Folks, if you are suffering from diabetes, a regular checkup is required. Pisceans, many opportunities in different sections are making its way during Retrograde Mars in Scorpio 2016. Your financial life seems to be very rich. As well as a great time is there for you to indulge into a new business. While, delaying a plan to purchase a new car will prove to be a good decision. Going abroad will be very beneficial, so do not miss any opportunity. Students who are interested in going for further studies, this period is very auspicious. Your long stucked money will now be debited in your account. Also, you can be in an open relationship or bachelors may receive a marriage proposal as well. Significantly, health and mental peace will remain at stake. We, hope our predictions for Mars retrograde in Scorpio 2016 made by our astrologer Neeraj Thapliyal has been helpful for you. May your future be as bright as Sun.